My newist video about he Samyang 16 mm F2.0 – a manual wide angle lens specially for APS-C-sensors… published now! Introducing with only some words: after enjoying the Samyang 10 mm F2.8, a weakly competetive 16-mm-lens would have been a disappointment. – However, it is not! See the main video + see the additional video (with more informations and detailed comparisons to show the lenses abilities comparing to the aperture used). 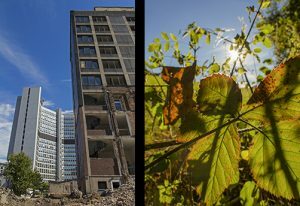 – Find more details about the Samyang 16 mm F2.0 and my use of in-camera adjustments in my additional article. 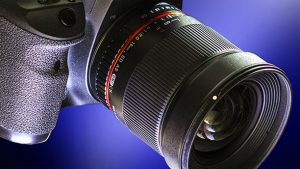 Samyang 16 mm F2.0 – a great wide angle lens for APS-C ! The Samyang 16 mm F2.0 is a very modest lens that does not cause sensation. You need another sense of good or bad to find it’s inner worth! This are the two characteristics that stand out mostly: • best lens coating provides high contrast and lowest ghosting • including aspherical lenses, this optical tool offers very low distortion. Using the Samyang 16 mm F2.0, you will not acquire a good reputation. With a fixed focus you do not enjoy the comfort of modern zoom lenses. You are – so to say – out of date. Using a manual lens on a modern body, you are by far out of date. In spite of such a sacrifice, using a big and heavy lens of 570 up to maybe 615 g (depending on your camera system) for nothing but a full frame aquivalent of 24 or 25.6 mm, maybe 30 or 32 mm (four thirds), might bring you into disrepute to be a little bit crazy. You, however, will be the one who knows the secret of this lens: greatest ability of an optical wide angle tool at an acceptable price. Outstanding quality specially for best results on APS-C-sonsors. Your price is to manage photographing without modern comfort. – A price you should be willing to give, if you do not need the comfort of controlling exposing easily via the camera body and if you do not need the comfort of autofocus and if you do not need the convenience of zoom lenses, when using such a strong wide angle lens of aquivalently around 24 mm. Watch my video about the Samyang 16 mm F2.0 to see examples of use and to see the offered quality . Read about the Samyang 10 mm F2.8 as well. If you want to have technical information directly from Samyang, so let me give you the shortest way to reach Samyang in the web: syopt.com. 5 letters PLUS the most common domain ending can easily be learned and easily be remembered: SamYangOPTics-dot-com. Dieser Eintrag wurde veröffentlicht in Erfahrungsbericht, Review und verschlagwortet mit review, third party lens, third party manufacturer von Gerhard Ochsenfeld. Permanenter Link zum Eintrag.